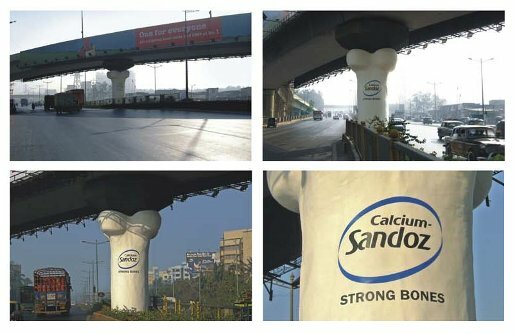 Novartis Calcium Sandoz calcium treatment is being promoted in a high profile outdoor advertisement in Mumbai, with what appears to be a huge bone supporting a motorway flyover. 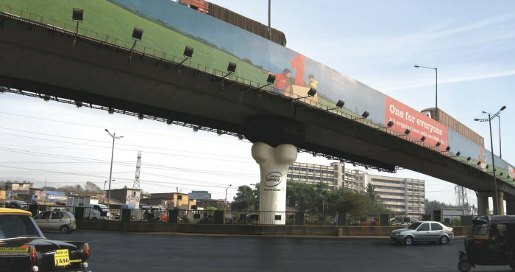 The pillar is under the Eastern Express highway near Sion, a suburb in Mumbai. 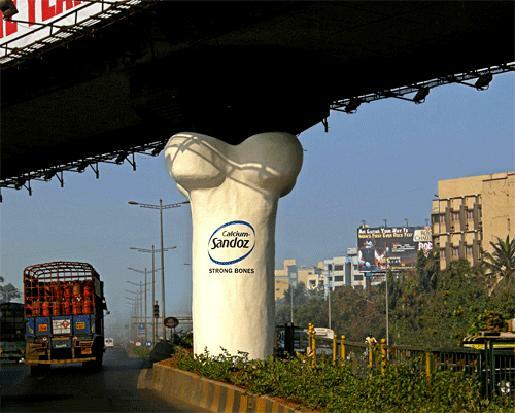 Vineet Singhal, OTC Business Unit Head at Novartis India, said, “The Calcium Sandoz brand has grown steadily over the years and we felt it was time to expand its base. We have introduced quite a few variants of the brand and are set to innovate on many fronts. On the communication side, we were keen to move out of the clutter and make our presence felt with a powerful message, so typical of the brand. Our endeavour was to extend the Calcium Sandoz brand association with superior strength. It is common knowledge that bones support the human body framework by holding the weight of the body. By having a giant bone ‘support’ the flyover, we are trying to make an obvious point! The idea certainly can’t go unnoticed, considering its location in a high-traffic zone, with thousands of vehicles going past all day”. The Novartis Bone Flyover campaign was developed at Saatchi & Saatchi Mumbai by creative directors Juju Basu, Hanoz Mogrelia, art director Sandeep Poyekar and copywriter Amit S Acharekar, and production manager Anand Siva.